The Stingers opened the Réseau du Sport Étudiant du Québec football season on a very high note. They kicked off their RSEQ slate at home on Friday night against league favourite Université de Montréal Carabins. On their first defensive series, they had the Carabins pinned back inside their own 15 yard line and were able to get a huge stop on third down and inches. The stop set their offense up in prime scoring position to take a lead and gain some early momentum. They weren’t able to turn that excellent field position into six points. Regular starting quarterback, Trenton Miller, was dealing with some shoulder discomfort and the Concordia staff decided to start backup signal caller, Colin Sequeira, for the first few possessions in his place. After failing to move the ball towards the end zone on that first series, placekicker Andrew Stevens connected on an early field goal. It was not the early outcome they had hoped for, but it was still an optimistic start to their 2017 campaign. That would not last long, however. On the ensuing Carabins possession, the visiting team moved their way down the field with surgical precision, completing pass after pass and constantly picking up solid yardage in the run game, much to the pleasure of the large Université de Montréal contingent at Concordia Stadium. With a little less than 10 minutes left in the first quarter, Carabins quarterback Samuel Caron linked up with wideout Kevin Kaya who made a nifty move to evade a tackle on his way to the end zone. Université de Montréal had gotten their first points of the season and, more importantly, took a seven to three lead in the game. 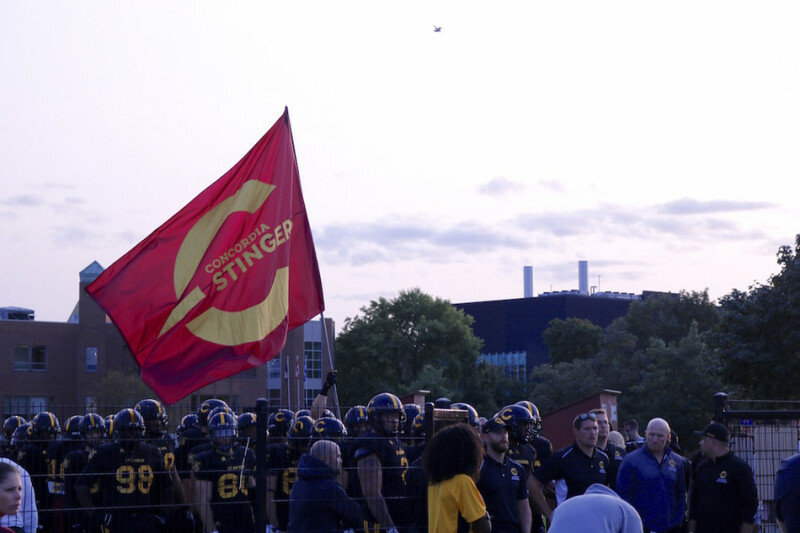 The Stingers would come to regret their missed scoring opportunity as it became the theme for the rest of the night. On the ensuing Carabins possession, Caron again had success with his arm, finding receiver Raphaël Major-Dagenais who beat Concordia cornerback Herman Akins for six points. Early on, the Stingers had no response for the visiting team’s prolific and multi-faceted offense. “We weren’t settled in and we lacked the right discipline earlier in the game,” said Donovan. The Carabins were rarely losing yards on running plays and their quarterback was hardly off his mark through the air. The Stingers, on the other hand, couldn’t muster much of anything offensively. As the first half wore on, however, the Carabins let their opponent back in. The Stingers defense began to buckle down and impose themselves, giving up zero points over the last 12:50 of the half. With that, the Stingers had two more second quarter chances inside the Carabins red zone. Again, they had no luck, though, being stuffed on third down the first time and settling for another field goal the second time. When Concordia could have gone into the halftime with the score tied at 21, they were down 21-6, and the team was well aware of it. The second half was more of the same from both teams. On their first possession of the third quarter, Caron found receiver Régis Cibasu for a short touchdown pass to extend the Université de Montréal lead to 30-6. Their next possession seemed to stall inside Concordia’s ten yard-line, until Carabins’ head coach Danny Maciocia opted for a fake field goal. Major-Dagenais escaped the Concordia defense and scored a touchdown, pushing the lead to 37-6. As was the case in the first half, one of the Stingers units settled in and began to flash some positives. Though their efforts were a case of too little, too late, the Stingers offense showed the type of explosiveness they had been lacking in the first half. 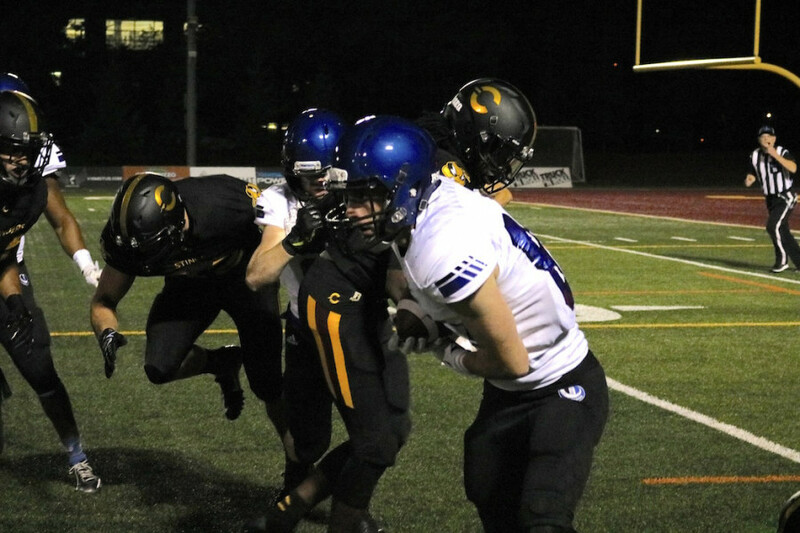 Running back Jean-Guy Rimpel managed to punch in two touchdowns in the fourth quarter to nearly bring the Stingers within a two possession deficit. 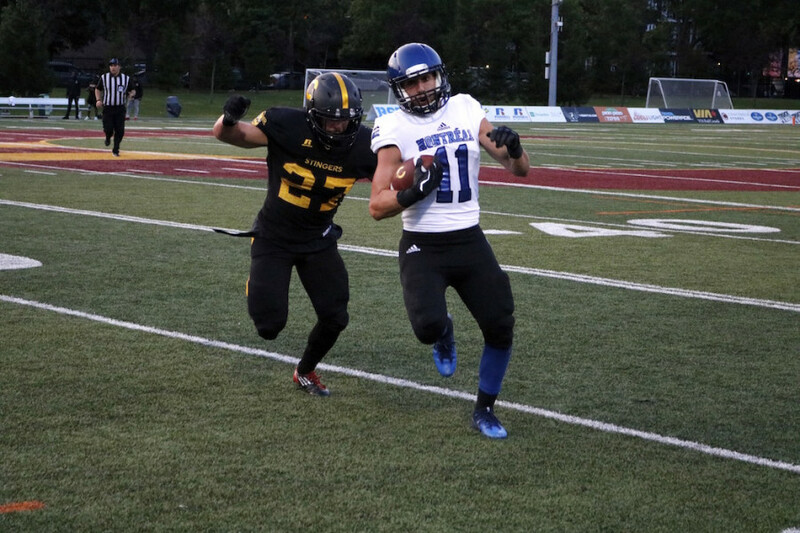 Their efforts were, indeed, insufficient and the Carabins held on for a 37-19 victory to slide their first game into the win column. Despite not playing for most of the first quarter, Trenton Miller was still prolific. He finished the game having completed 24 of his 39 pass attempts for 368 total passing yards, actually eclipsing Caron’s mark of 338. Rimpel was the leading rusher for the Stingers, gaining a very modest 42 yards in the game. Carabins running back Gabriel Parent was far more effective, picking up over five yards per carry on his was to an impressive 96-yard performance. The rough season-opening loss did help the Concordia staff gauge what they needed to work on moving forward. Amongst those things, according to Donovan, is just playing with more consistency and being able to put together good stretches of football—not simply having a few good possessions without much to show for. 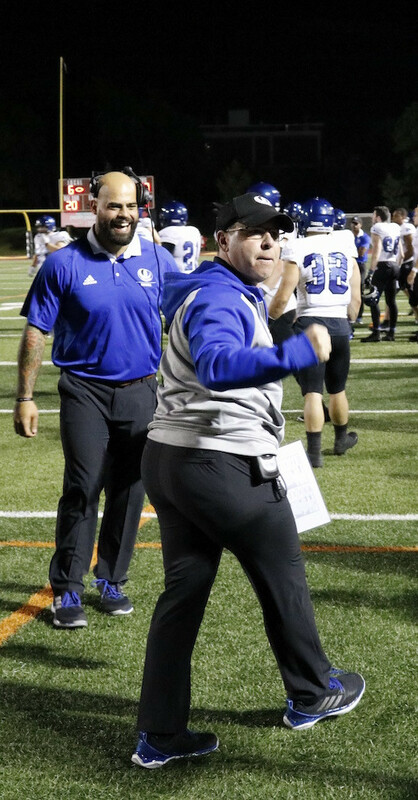 “It’s a long season, if the guys stop making the same mistakes that hurt us early on and listen, stay disciplined and follow their cues, I’m almost positive that we’ll find a better rhythm on both sides of the ball,” said Donovan. The Stingers head to Sherbrooke to face the Vert et Or next Thursday in search for their first win of the eight-game RSEQ slate.